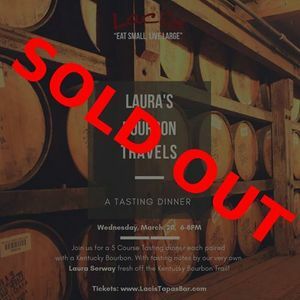 Laci’s Tapas Bar presents "Laura's Bourbon Travels", part of our Taste & Tell Tapas Series. Experience delicious Kentucky Bourbons, each paired with an artfully crafted tapas course. Fresh off the Kentucky Bourbon Trail our very own Laura Serway will be giving tasting notes and stories from her trip to Kentucky and its numerous distilleries. Seating is limited so reserve early online, over the phone, or in person at Laci’s Tapas Bar. We look forward to seeing you there! Salute!